Bex has recently joined the Better Body Group after completing her BSc and PgD. 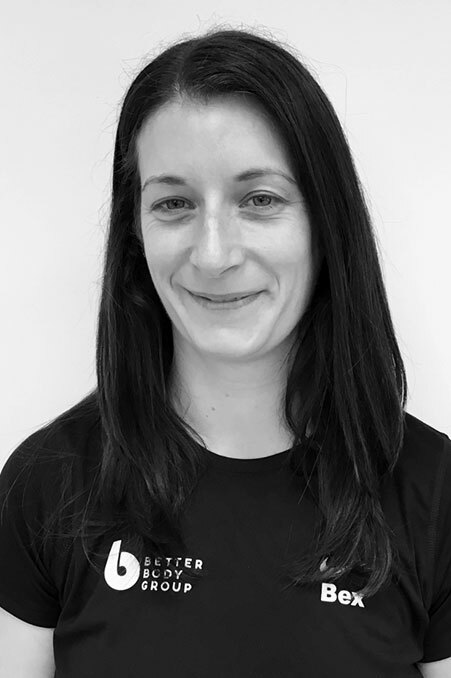 She has amassed several industry qualifications including a level 2 British Weightlifting coaching certificate, taping and strapping certificate, kinesiology taping, level 3 sports massage diploma and a pregnancy massage diploma. She is currently studying for a Level 5 Diploma in Clinical & Remedial Massage with the Institute of Sports and Remedial Massage and runs a mobile massage business in her spare time. Bex has competed nationally and semi-professionally for the past 10 years in rugby union reaching premiership level with Thurrock T-Birds 1st XV playing wing and fullback predominantly. She has represented Essex County for the past 6 seasons and plays a variety of 7’s tournaments throughout the off season. Bex crossed over to the dark side and was introduced to Olympic weightlifting 2.5 years ago by her current coach. She has reached a national level, competing at English championships for the last 2 years running and is pushing to reach the British qualification standard at present. She has been a keen gym princess for the past 8 years and is experienced in strength and conditioning, olympic weightlifting, rugby strength & fitness and general fitness and weight loss issues. Bex has worked with professional dancers, rugby players, weightlifters and gym goers to increase their strength and muscle definition, educate them about nutrition and provide injury management and advice when needed. If you have any questions about corrective exercise or rehabilitation please don’t hesitate to ask. Olympic weightlifting vs Powerlifting…what’s the difference? !